Set at the end of Winged Foot Drive is the access to 21.10 acres which is a mix of wooded land and approximately 2.5 acres of open ground. This property is not within city limits. 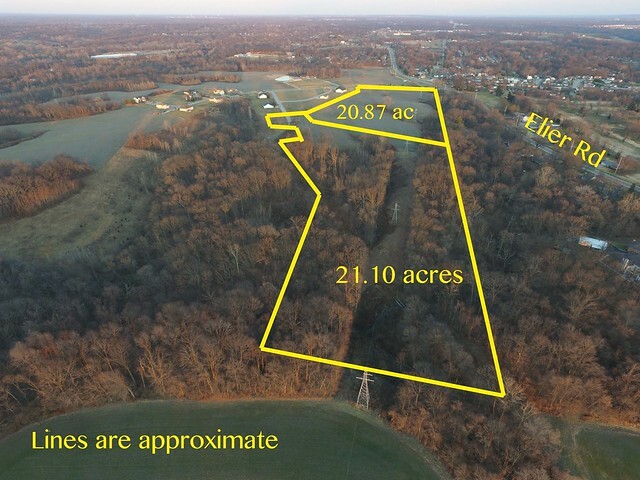 Nice place to build a home and have some property to roam on, yet not too far from town and an easy drive to St Louis. Millstadt Grade School/ Belleville Grade School. The parcel number for this property is assigned to a larger property so it is subject to be changed with the division. The property will be surveyed. Most points on this property have already been surveyed. There is a buried fuel line running across the property. Plus there is adjoining land for sale. Directions: Eiler Rd to Olde Lantern Drive then to the end of Winged Foot. Surveyor is part owner of the property. All information provided through this website was obtained from sources deemed reliable; yet Property Peddler and the Peddlers of Property Peddler make no guarantees as to the accuracy of information. All sketches and dimension on this website are approximate and should be verified. All acreages are approximate and have been based on aerial photography, tax maps or plat maps and are in no way guaranteed and the buyer might consider for it to be confrimed by a licensed surveyor. Prospective buyers should rely on their own personal inspection and/or the inspections of a professional property inspector for the condition of the property. As for the title work it is the responsibity of the buyer and/or the buyer's attorney to inspect. We suggest prospective buyers to do their own due diligence regarding their purchase. The seller nor Property Peddler assume liability for the accuracy, errors or omissions. Seller reserves the right to refuse any and all offers submitted and may withdraw the property from offering without notice. © Property Peddler. ALL RIGHTS RESERVED.